Unknown image found on Flicker (was labeled “1530 Pink Kirtle” with no other attribution, although I believe that date to be a little late). Appears to be cropped and Photoshopped from a larger work. Similarities to Promenade: shoulder straps angle toward the neck; she seems to shop at the same milliner. Fanciful sleeves are typical of this type of gown, as is the salmon pink and dark blue coloring. 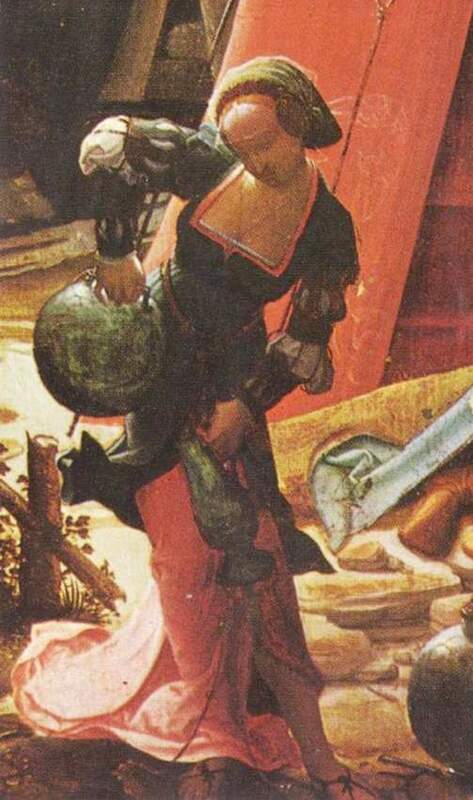 Hans Holbein, St. Barbara (detail), 1515. She lacks the gown sleeves, but her chemise (note the blackwork!) more than makes up for it. Detail from Lucas van Leyden, Lot and His Daughters. See her German-style puff-and-slash sleeves, the “halter angle” of the neckline, and the shorter overgown skirt. 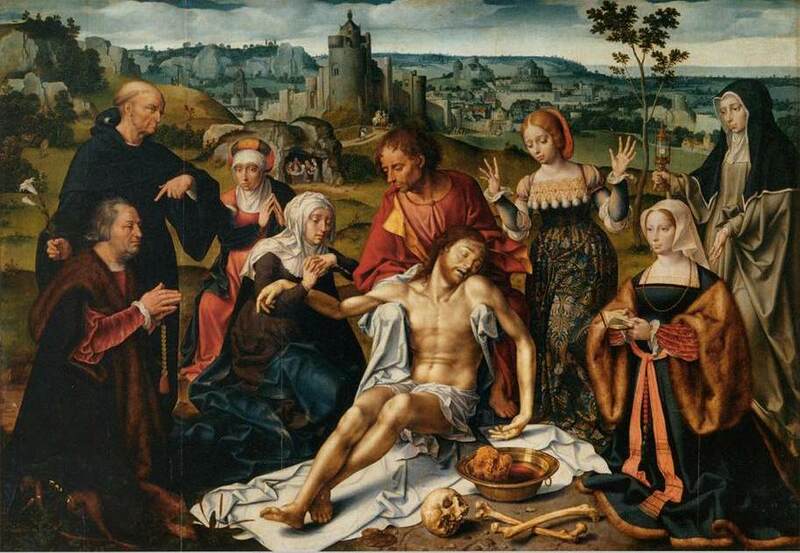 Detail from Christ Taking Leave of His Mother by Cornelis Engebrechtsz (1515-1520). The weeping woman in the foreground wears the gown we’re most interested in here, with its elaborate foresleeves, brocade kirtle, and beautifully-depicted lined gown… but if you look closely, she and her companions are almost wearing Queen’s Servants-style transitional gowns, with set-in sleeves and mismatched necklines (the woman in pink seems to also sport an odd forerunner of the Mysterious White Tudor Strap, only hers is black). 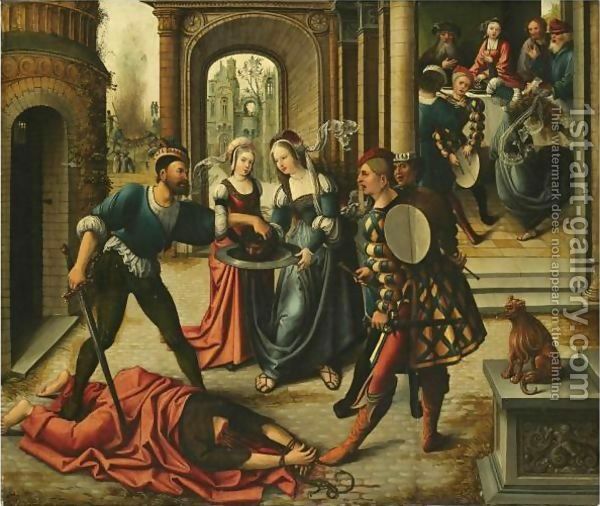 The Martyrdom of St. John the Baptist, Bernaert van Orley, 1515. Lots of interest happening here–first, you can see how to dress your menfolk to match you, when you’ve finished your Fanciful Netherlandish Transitional Gown. Second, Salome’s handmaiden wears an unusual curved and embellished neckline. Third, this painting continues the popularity of the dark blue and salmon pink color scheme evident in several of the other gowns. Lastly, the servant in the background is wearing the more common transitional gown. 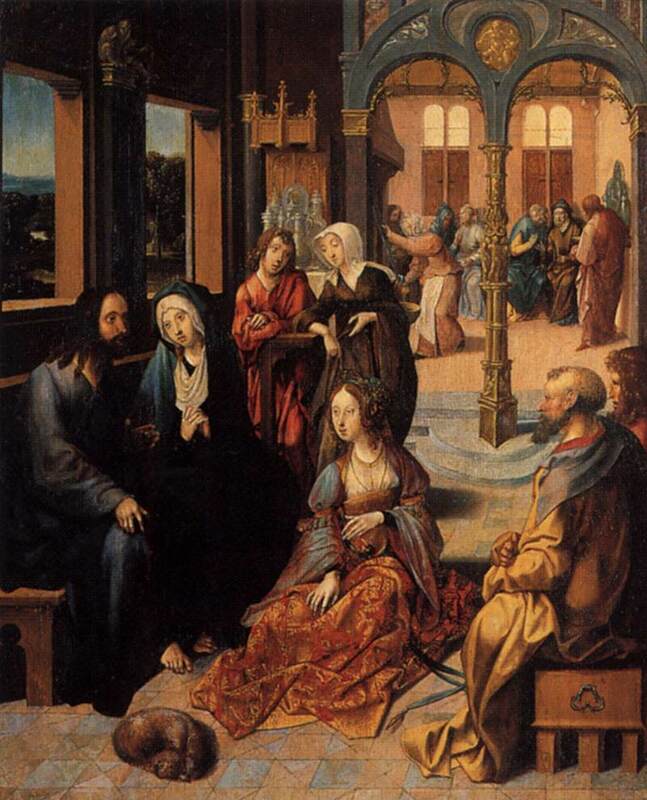 Another work by Engebrechtsz, Christ in the House of Martha and Mary. What’s notable here is the wonderful brown gown/robe of the older woman in the background, while the woman at center front wears an elaborate ensemble of brocade with changing-color silk sleeves, showing (like St. Barbara, above) that these gowns weren’t always solid colors. Joos van Cleve, Altarpiece of the Lamentation (center panel), 1520-1525. This is a bit late for this style of gown, and van Cleve is known for painting beautiful portraits in Tudor-style dress (as sported by the kneeling donor with her tawny sash and ginormous fur sleeves). You can see a much larger version of the full painting here. 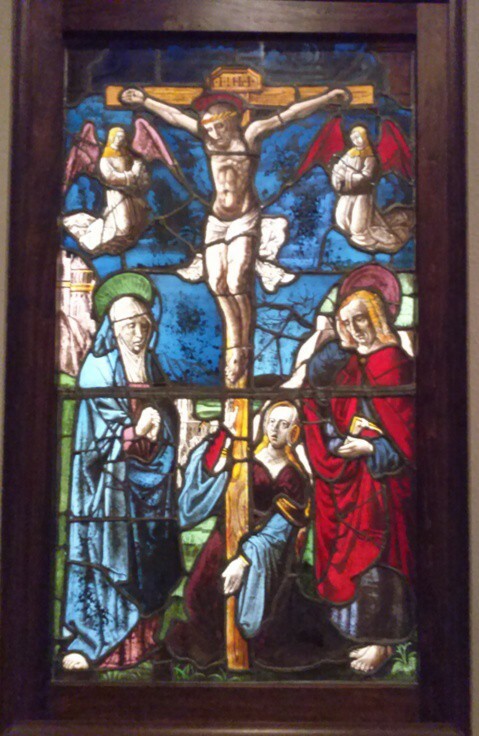 This is primarily notable for the concurrence of the donor in her later gown alongside wailing Mary Magdalene in her FNG of blue brocade and its, um, tassels. Mary (at left) wears what looks like the high-necked smocks (German, hemd) popular a little earlier in our period. 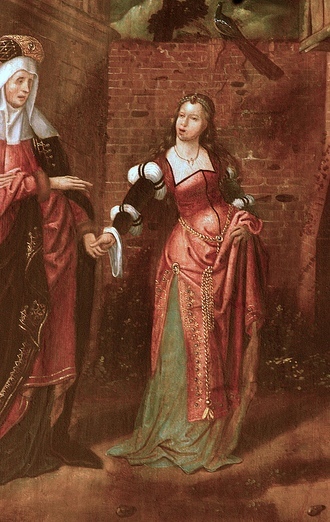 Unfortunately, I can’t identify this image, either (and it may well not be Netherlandish at all), but it’s a wonderful confluence of the salmon pink + shorter overgown skirt + overgown skirt split up the side (a la Promenade), + the iconic “W” neckline of the classic Tudor transitional gown.